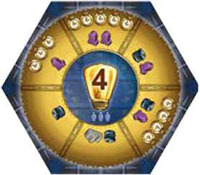 Each player leads a research team consisting of an Engineer and a Scientist, which move on 2 different game boards, as well as a group of bots, which carry out actions. In the Headquarters, the Engineer programs the bots and, thus, determines which action will be carried out. Meanwhile in the Research Station, the Scientist determines where the bots will carry out the action. Over the course of 4 rounds, the teams will use their actions to gain as much knowledge as possible. Put the 6 Sectors of the Station 1 together in any order. Place the Headquarters 2 next to it, but not too closely. Leave some space for the general supply 3. 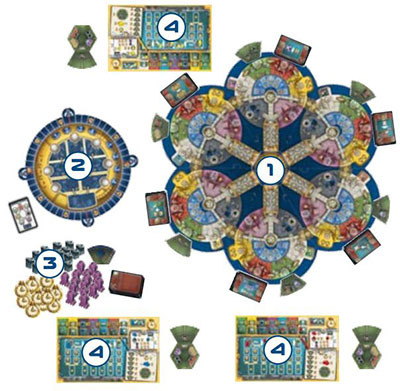 Each player chooses a player color and takes the wooden playing pieces of that color and a Player Board 4. Shuffle the Program Cards 5 and place 4 of them in a stack next to the Headquarters. Put the remaining Program Cards back into the game box. Place the Programming Tiles 6 on the appropriate spaces in the Headquarters (see example below) as indicated by the topmost Program Card. Then put the topmost Program Card back into the game box. 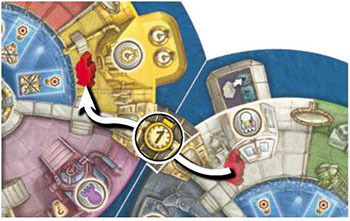 The Starting Player (here: Red) places one Bot on the first space of the Play Order Track Then, in clockwise order, each other player places one Bot on the next free space of that track. 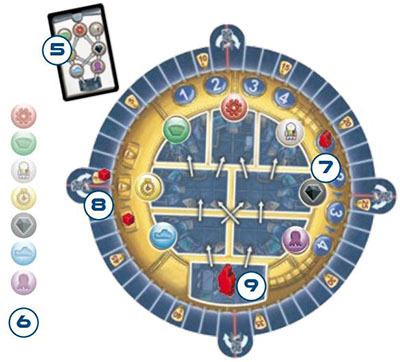 Each player places one Counter on space "0" of the Knowledge Track 8 and the other one on space "0+" of the Full Circle Counting Track. 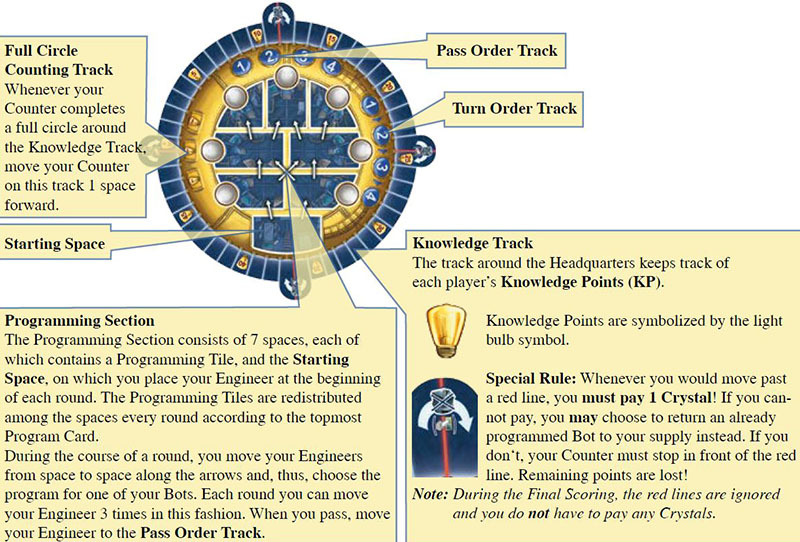 Each player places one Engineer on the Starting Space of the Programming Section 9. 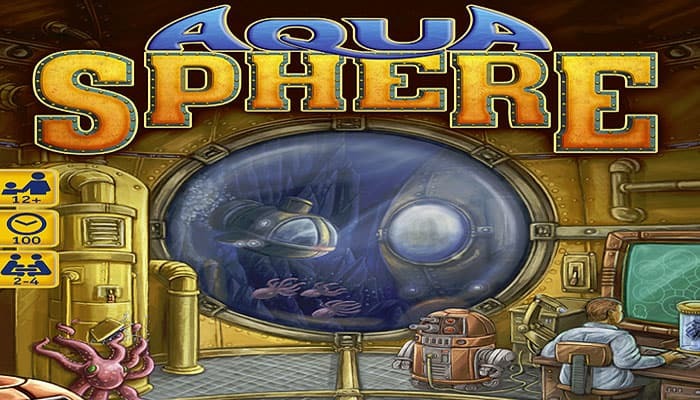 Place the following items next to the Station as the general supply: the Crystals, Octopods and Time Markers, as well as the shuffled stacks of face-down Lab Expansions and Research Cards. 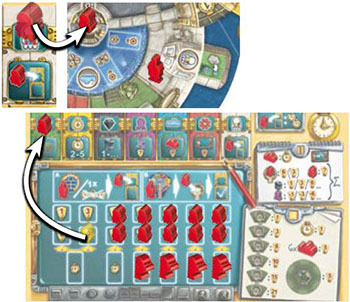 6 Submarines on the corresponding spaces of their Player Boards. Each player receives 1 Base Lab at random, and places it next to the Player Board. The letter on the tile indicates that player's Starting Sector. Place the tile with a 5 in its light bulb in the middle of the Station. Then place the tiles with a 4, 3 and 2 on top of it (in that order), each with a random orientation. Take the appropriate Setup Overview Card corresponding to the number of players. 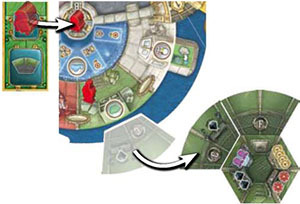 The upper block indicates the components that populate each player's Starting Sector (see c). The rows on the bottom indicate the components that populate the remaining sectors (see d). Note: The playing pieces of the unused colors are considered "neutral". Each player whose Starting Sector is adjacent to a "0" lock gets 3 Time Markers. Each other player gets 4 Time Markers. Determine the color of the Programming Space in the white Area of your Starting Sector. 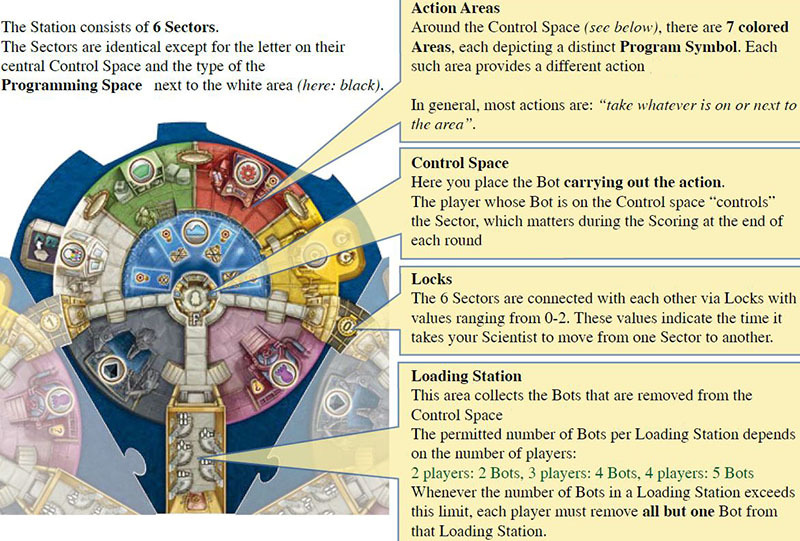 Place your remaining Bot on the corresponding Program Symbol of your Player Board. During setup, you received a Base Lab. The symbols in your Lab indicate how many of each resource you may keep in your personal supply, i.e. the overall capacity of your personal supply is limited by the size of your Lab! You may never exceed your capacity, even if we do not mention it explicitly every time it matters. If you wish to increase your capacity, you will have to add Lab Expansions to your Lab. For each such symbol, you can keep 1 Research Card (at the start: 2). For each such symbol, you can keep 1 Crystal (at the start: 2). For each such symbol, you can catch 1 Octopod (at the start: 2). For each such symbol, you can keep 1 Time Marker (at the start: 4). Also, most of the Lab Expansions have a letter. Every time you acquire such a Lab Expansion, you may place 1 Bot on the Control Space of the corresponding Sector if you wish. 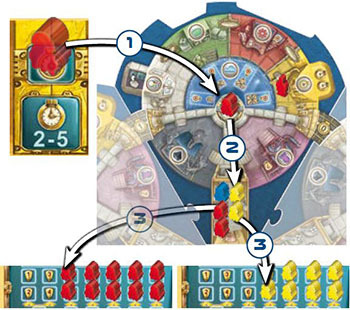 Beginning with the Starting Player, you take turns (see below) in the order indicated by the Play Order Track until everyone has passed. Then, there is an Intermediate Scoring and the next round is prepared. The next round will be played in the order you have passed in the previous round. After the fourth Intermediate Scoring, there is a Final Scoring. The player with the most Knowledge Points after the Final Scoring is declared the winner of the game. 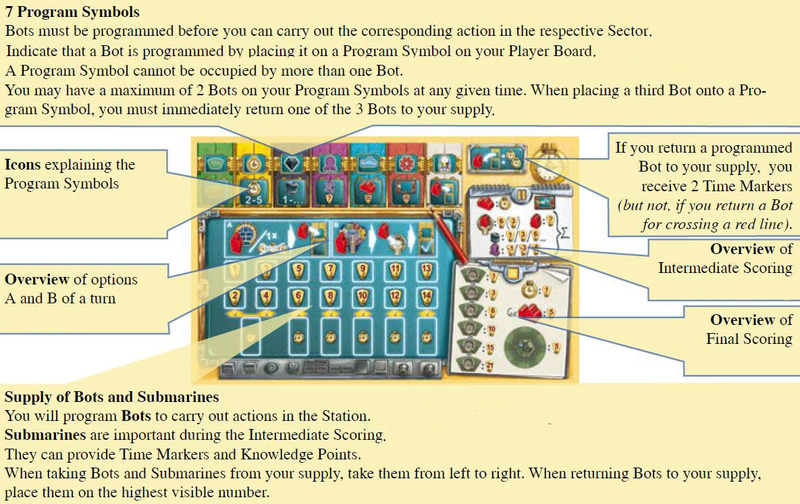 When programming a Bot, take the next available Bot from your supply and place it on an available Program Symbol on your Player Board. Reminder: You may not have more than 2 programmed Bots at a time! Move your Engineer in the Headquarters 1 space forward along an arrow. Each space in the Headquarters has 2 outgoing arrows. The Programming Tile where the Engineer ends up indicates the Program Symbol on your Player Board on which you place the Bot. This Bot is now considered "programmed" to carry out that action. Note: If you have Research Cards that activate on entering a specific space in the Headquarters, you may use them now. Once per round, you may pay 3 Time Markers to place a Bot on any unoccupied Program Symbol. Place one of the Time Markers you paid on the Time Marker symbol in the right upper corner of your Player Board to indicate that you have used this option. This option consists of 3 steps that must be carried out in the given order. a. Optional: Move your Scientist to another Sector. Pay the depicted number of Time Markers for each Lock the Scientist passes through (0-2 per Lock). b. 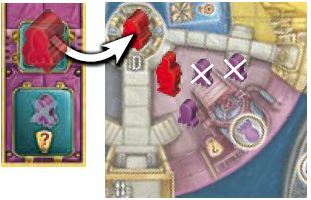 Place your Scientist in one of the colored Action Areas for which you have a programmed Bot on the corresponding Program Symbol of your Player Board. Example: Red moves a Scientist to the action area shown, paying 1 Time Marker to use the Lock. Move the Bot from the corresponding Program Symbol to the Control Space of the Sector your Scientist is currently in. If the Control Space is occupied by another Bot, move that Bot to the Loading Station of the Sector. If the number of Bots in the Loading Station now exceeds the permitted number, each player must return all but one Bot from that Loading Station to their supply. 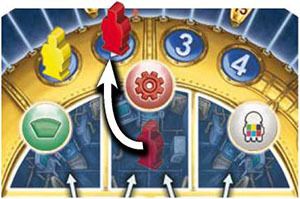 Example: Red moves a Bot from a Program Symbol onto the Control Space of a Sector 1, displacing the yellow Bot, which is moved to the Loading Station 2. In a 3-player game, this causes the Loading Station to be overcrowded. Therefore, Red and Yellow must each remove 1 of their Bots from that Loading Station 3. Blue does not remove a Bot because each player keeps 1 Bot in the Loading Station. You may now carry out the action of the Action Area that is occupied by your Scientist. Note: If you have Research Cards that activate on carrying out a certain action, you may use them now. Move your Engineer token in the Headquarters onto the next free space of the Pass Order Track. This terminates your round. Note: Your Engineer can only leave the Programming Section from one of the depicted spaces. It does not make sense to pass earlier anyway. At any time during your turn you may return an already programmed Bot to your supply to get 2 Time Markers from the general supply. You don't get any Time Markers, if you return a Bot for crossing a red line. Take the topmost Lab Expansion from the Sector and place it next to your Base Lab (at any position). If the Lab Expansion shows 1 or 2 letters, you may place 1 Bot on the Control Spaces of each of the corresponding Sectors. If the Control Space is occupied by another Bot, move that Bot to the Loading Station of the Sector. If the number of Bots in the Loading Station exceeds the permitted number, each player must return all but one Bot from that Loading Station to their supply. The permitted number of Bots per Loading Station depends on the number of players: 2 players: 2 Bots, 3 players: 4 Bots, 4 players: 5 Bots. After completing your Lab (adding 5 Lab Expansions), you may not take another Lab Expansion. A completed Lab is worth 5 Knowledge Points at the end of the game. Example: By adding the depicted Lab Expansion, you increase the number of Crystals you can store to 3. Also, you may place a Bot from your supply on the Control Space of Sector "C". Take the Time Markers that are lying next to the yellow area. If you did not get at least 2 Time Markers, take additional Time Markers from the general supply, until you have received a total of 2 Time Markers. If you cannot take all of the Time Markers (due to your Lab capacity), only take as many as you can accommodate in your personal supply and leave the remaining ones in the Sector. Example: You would get 5 Time Markers, but your Time Marker Capacity is only 4 and you already have a Time Marker in your supply. Therefore, you only get 3 Time Markers; your Lab is full now. Take as many Crystals from the Sector as you can accommodate in your personal supply. Leave the excess Crystals in the Sector. Example: You receive 2 Crystals. Your Lab has capacity for 3 Crystals, so you can only hold 1 more. Return the caught Octopods to the general supply. Example: According to your Lab, you may catch 2 Octopods. You get 3 Knowledge Points for that. The third Octopod remains in the Sector. Take the next Submarine from the left of your Player Board and place it on the next available Submarine Space in the Sector. Pay as many Time Markers as depicted on the space. If you cannot pay, you may not choose this action! You get as many Knowledge Points as depicted in the light bulb on the current Center Tile. If you have placed all 6 of your Submarines in the Sectors, you will get a bonus of 5 Knowledge Points at the end of the game. Example: You place a Submarine in a Sector. You pay 2 Time Markers and get 3 Knowledge Points. Take the topmost Research Card from the Sector and place it next to your Player Board. You get as many Knowledge Points as depicted in the light bulb on the current Center Tile. Note: You may only take another Research Card if you can accommodate it (according to your capacity). You may not discard Research Cards even if they already served their purpose! 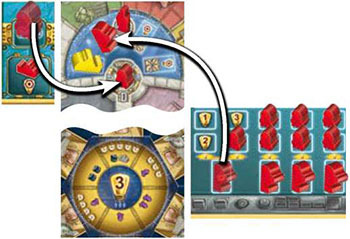 Take the next Bot from your supply and place it on the Program Symbol of your Player Board matching the depicted symbol in the white Action Area of the Sector. Note: If the Program Symbol is already occupied, take 2 Time Markers instead and leave the Bot in the supply. Example: The Programming Space of the Sector is the green "Expand Lab" action. Place the next Bot from your supply onto the green Program Symbol of your Player Board. When all players have passed, there is an Intermediate Scoring. You get 1 Time Marker per Submarine you have deployed in the Station. Return any Time Markers from the top right corner of your Player Board to the general supply, if any. If You Have Any Research Cards With The Symbol, You May Use Them Now. Note: Each player may decide individually in which order to carry out these two steps mentioned above. Add up the total number of Knowledge Points (KP) for each player individually, before you adjust the Counters on the Knowledge Track. Reminder: To cross a red line you must pay 1 Crystal. If you have no Crystals, you may choose to return a Bot from one of your Program Symbols to your supply (without receiving any Time Markers). If you do not pay a Crystal or return a Bot, then your score marker must stop at the red line - additional Knowledge Points are lost. Who has the most Bots on Control Spaces? A player with more Bots on Control Spaces than any other player gets 6 KP. If two or more players are tied for the most Bots, they each get 3 KP. In the Bot Supply Section of your Player Board, determine the highest number in a column with no Submarine that is not covered by a Bot. You get a number of KP equal to that number. In each Sector with one of your Bots on the Control Space, you lose a number of KP depending on the number of leftover Octopods in that Sector. Special case: In theory, you could lose points during an Intermediate Scoring. In this case, you cannot fall back behind a red line (this should happen very rarely). Draw 6 Research Cards from the draw pile and place one in each of the Sectors (on top of already existing Research Cards, if necessary). 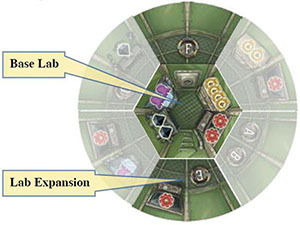 Draw 6 Lab Expansions from the draw pile and place one in each of the Sectors (on top of already existing Lab Expansions, if necessary). Time Markers: Remove any leftover Time Markers from the Station. Then place new Time Markers in each Sector according to the Center Tile. Crystals: add them to the already exisiting ones, if any. Octopods: add them to the already exisiting ones, if any. 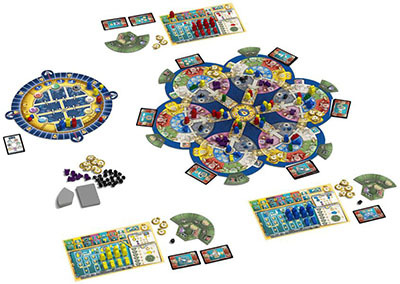 Neutral Submarines (in 2- and 3-player games): There may not be more than 1 Submarine of each color in any given Sector. If you cannot place a neutral Submarine in the indicated Sector due to this rule, place it in the next legal Sector in clockwise order, in which it is possible. Put the topmost Center Tile back into the game box. Tip: To speed up things, one player should handle the Research Cards and Lab Expansions, and another player should handle the Center Tile. earrange the Programming Tiles as indicated by the topmost Program Card. After that, put the topmost Program Card back into the game box so that the next Program Card becomes visible. Immediately after the 4th Intermediate Scoring, proceed with the Final Scoring. During the Final Scoring, you do not have to pay Crystals for passing red lines. The player with the most Knowledge Points wins the game. In case of a tie, the player with more Bots on Control Spaces wins. If still tied, the player with more Crystals wins. Otherwise there are multiple winners.